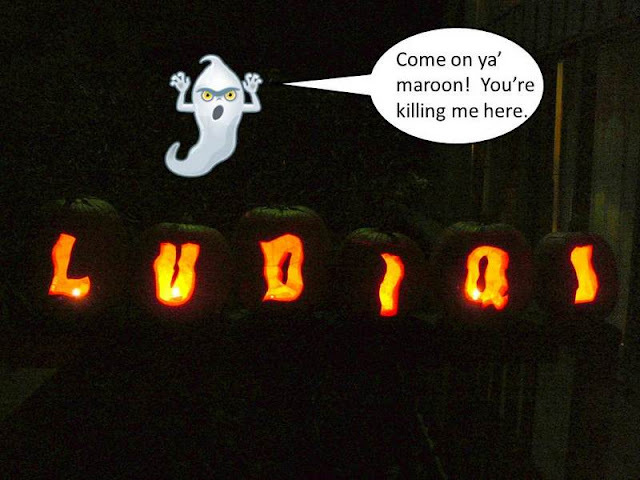 So Happy Halloween to all of you out in Blogland. 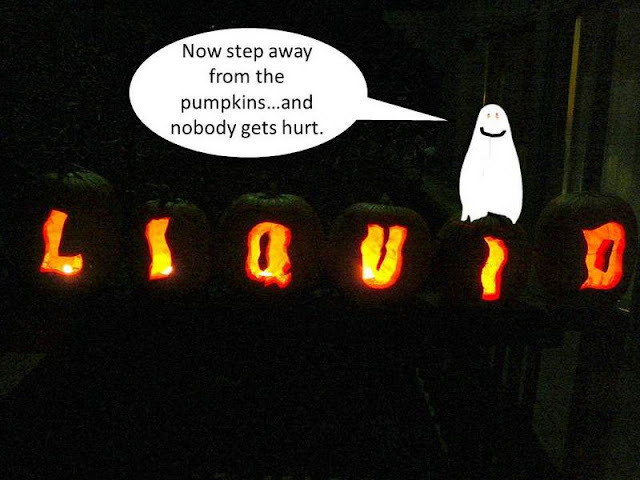 Last year I took a stab at LIQUID pumpkin carving with pretty good results. Here is a re-run of the picture from exactly one year ago in 2011. So how could I top that for 2012? I know…instead of one pumpkin (which anyone could do), why not six! After hours of careful carving and still having all my fingers and thumbs in place, I was finished. Now to arrange them on the porch. Hmmm, not as easy as I thought. A little re-arranging….D’oh….still wrong. 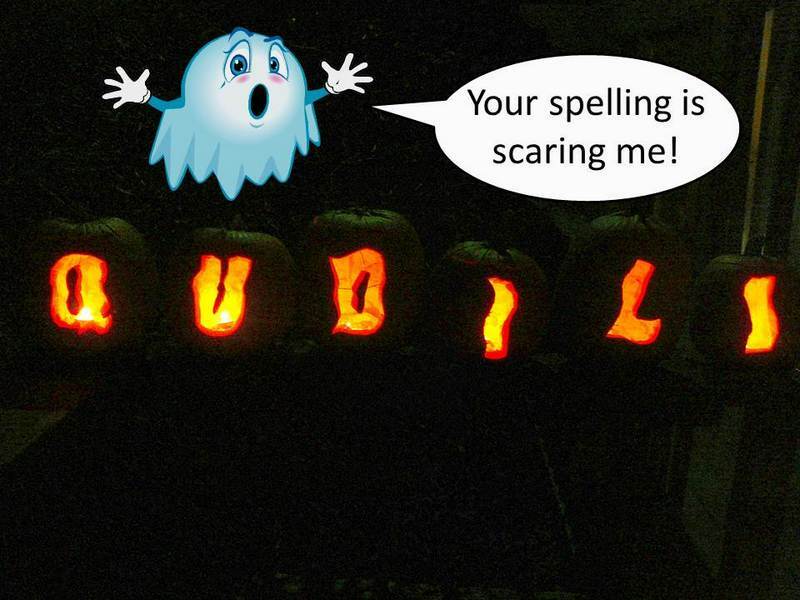 I need a pumpkin spell-check. I suppose now all of the Trick-or-Treaters will be expecting a bag full of Pro-Germinator. I better stock up. Happy Halloween. To compare nutrient programs when used in combination with and without manure applications.The North Central Research Station has applied dairy manure to areas of this particular field for 16 straight years. The crop for the previous 15 years has been continuous corn. The experiment is divided into 4 sections, 2 sections have no manure applied, 1 section receives a 20 ton/A application in the fall and the fourth section receives an application in the fall and spring for a 40 ton/A total. Fall applications are chisel plowed into the soil, while spring applications are applied to spring tilled soil and then tilled with a soil finisher for soil incorporation. Soil samples were taken again last fall to continually observe the changes in soil tests. All treatment rates follow soil test recommendations with the exception of phosphorus. According to soil test recommendations additional phosphorus fertilizer is not recommended in any of the sections. However, in corn, past research has proven that available phosphorus close to the seed at planting time in the cooler soils will give a stronger plant, increased growth and limit phosphorus deficiency symptoms. Therefore, the standard recommendation of 3 gal/A of Pro-Germinator (PG) was used in the planter fertilizer. The remaining nutrients include 2 qt/A of Micro 500 + 10 gal/A of High NRG-N (HN) all applied 2×2. The no manure section also received 10 gal/A of Sure-K (SK) in the planter fertilizer to meet the recommendation. • Significantly higher yields were achieved with the use of manure. Fall and spring applications resulted in a 40+ bu/A increase over the no manure treatments. • Organic matter, Phosphorus and Potassium levels all increase with the use of manure. • Maintain accurate soil tests and follow recommendations for supplemental nutrient application. Most likely potassium usage can be reduced. • Micro nutrients and some Phosphorus are still needed for corn. To evaluate an experimental nitrogen product for yield response on corn. Agro-Culture Liquid Fertilizers is continuously working on improving their products, to provide better resources for growers. In 2013, an experimental nitrogen product, NF-13 was added to the testing protocols. This product is a nitrogen solution with sulfur and has a recommended application at 80% of the conventional nitrogen rate. In order to pass the rounds of testing to become a new product, experimental products like NF-13 have to provide a significant benefit over the existing product. It also has to have proven performance at the NCRS along with contract research sites and on-farm testing. In the first year of testing, the experimental product NF-13 at 56 gal/A was compared to the recommended rates of High NRG-N, 28% + eNhance and 28%. Applications were made at sidedress, 37 days after planting to V4 corn. Yield results appear on the chart above. • At this location, NF-13 did not yield as high as High NRG-N. Continued evaluation of yield results on this product will need to be done to determine if more testing should be done. • Highest yield was achieved with 28% + eNhance with a yield of 200.7 bu/A. This yielded similar to a higher rate of 28%. Plant nutrition is integral to potato production. Both quantity and quality of potato harvests depend on proper nutrition. Providing the right fertilizer, at the right time, in the right place, and at the right rate is one component in a comprehensive risk management plan. Learn more about fertility considerations for optimal potato production in the latest Spudman Webinar. Click here to watch.